International construction equipment manufacturer Chicago Pneumatic has unveiled the first new products in its expanded range of reliable and efficient concrete equipment with the addition of new surfacing tools. The new SCS 32 spreader wagon and STG power trowels deliver fast and clean work for the layering and smoothing of concrete. The new range is ideal for a range of surfacing applications including concrete slabs, industrial warehouse floors, residential housing, car parks and alleyways. 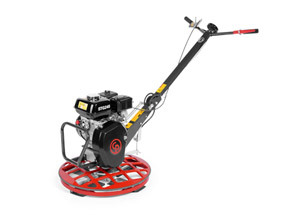 Chicago Pneumatic has updated its STG line of power trowels with the introduction of the new STG245 (24” – 60cm) for small slabs and STG365 (36” – 90cm) and STG465 (46” – 120cm) models that are ideal for larger slabs. With high speed rates from 40 to 140rpm, coupled with low hand and arm vibrations, the new range of trowels can be used for an extended period of time without the risk of user injury. Fully compliant with CE requirements, the new trowels are equipped with an ignition kill-switch when the dead man handle is released and include a twist pitch allowing up to 22° of blade angle adjustment. Equipped with lifting devices for the safe movement of equipment, the new trowels are easy to store and maneuver, ensuring maximum flexibility and productivity. The durable new SCS 32 spreader wagon is designed to evenly distribute all types of granolithic concrete material while pressing it into the upper layer for a long-wearing surface. Instead of wheels, the spreader wagon features an innovative mesh screen roller that carries the weight of the machine at the same time as it presses the granolithic material into the concrete. This helps the material bond with the concrete for increased wear resistance and provides a reliable, even finish. The SCS 32 is easy to operate and includes flow adjustment on the handle to enable users to determine the exact quantity of material needed with a lockable feature for a consistent, even flow. Chicago Pneumatic will also soon be making a further expansion to its concrete range with the forthcoming introduction of new truss screeds designed to maximize productivity during the screeding process.